The authentic rolling stainless steel cart features durable construction, 2 convenient shelves, locking brakes, a raised edge to keep tools and cooking projects where they belong. 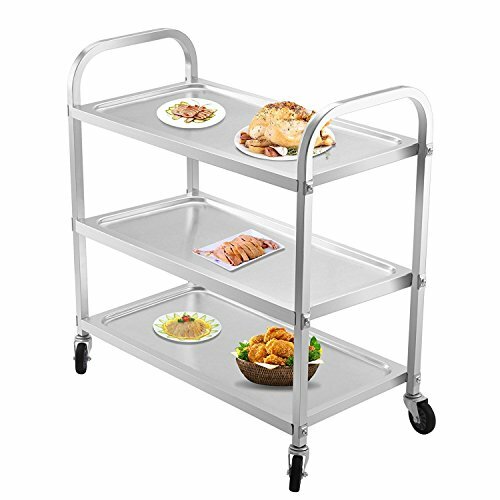 Transporting dishes, food, or supplies is easy with this rolling stainless serving cart. The cart is made with high-polish stainless steel and features convenient handles, so you can move large loads with ease. Being perfect for large parties it will allow you to serve your guests easily and efficiently without the hassle of having to carry things around. Overall Height - Top to Bottom: 35.5"
Overall Length -Side to Side: 35"
Width- Front to Back: 18.5"
Kitchen cart with storage:Overall Height - Top to Bottom: 35.5", Overall Length -Side to Side: 35"Overall Width- Front to Back: 18.5"